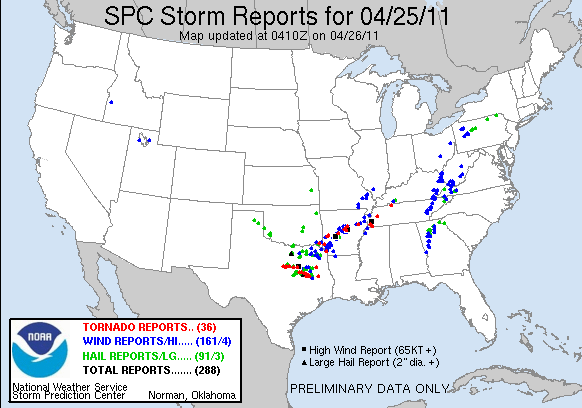 So far the severe weather outbreak of late April 2011 has brought devastation to many different areas in the southern Plains and Southeast. A tornado that was probably of a violent intensity hit a small town in Arkansas last night, reportedly removing pavement from the ground, and tornadoes have touched down from Texas through Arkansas and Louisiana into Mississippi, Tennessee, and Kentucky today. The severe weather is going to continue through Wednesday as the second of two low pressure centers intensifies over the mid-South. 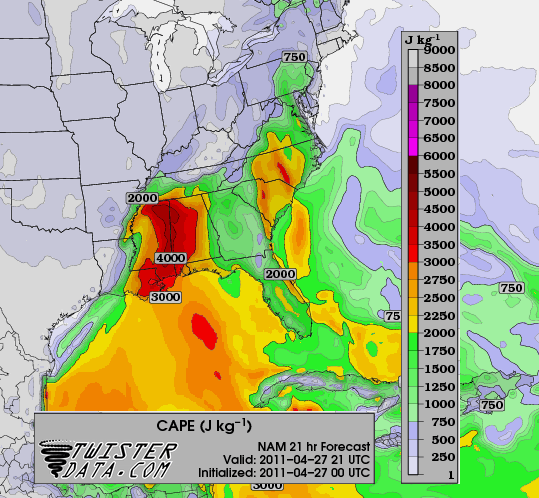 For specific tornado threat regions, the NAM model has been fixing on an area centered over the Tennessee Valley. 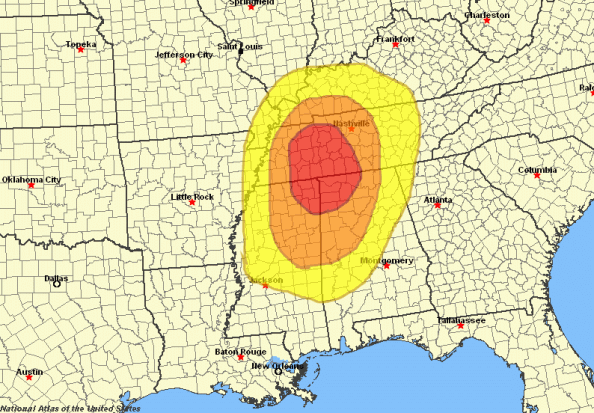 Yesterday the bull’s eye appeared to be right over the state of Tennessee, but today, it has shifted somewhat south. 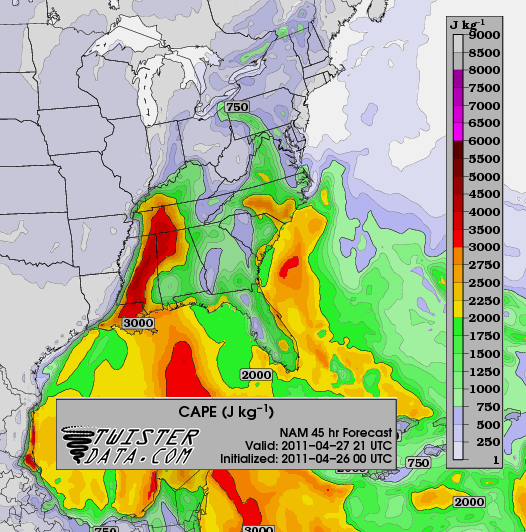 The 00 UTC run has CAPE peaking around the same value as before. Bottom line? I think that at this stage, such deviations are just model noise. Observations will be needed to determine exactly what area will have the highest risk of severe weather tomorrow. 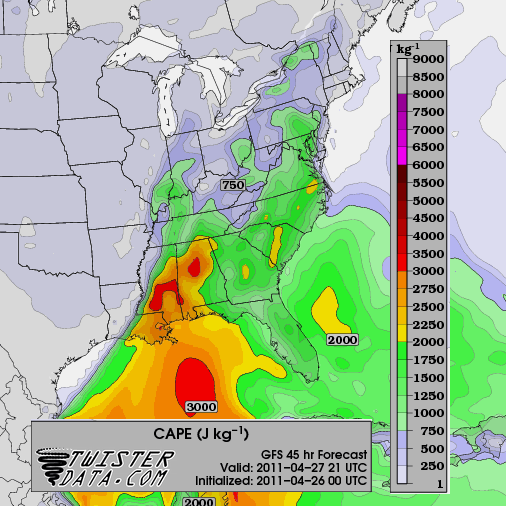 However, it is important to note that the model has been very consistent with an elevated tornado threat Wednesday afternoon in the Tennessee Valley area. With that in mind, I offer up my own subjective severe weather threat map for this event. I am not assigning probabilities to any of the color regions of this map; they are present only to indicate the areas that I think are in increasingly higher danger of seeing powerful severe weather, including long-tracked tornadoes. The year is off to a record start in tornadic activity, and more is on the way. Another three-day tornado outbreak is currently underway, with day 1 having brought close to 40 tornado reports and over 250 hail and wind reports. 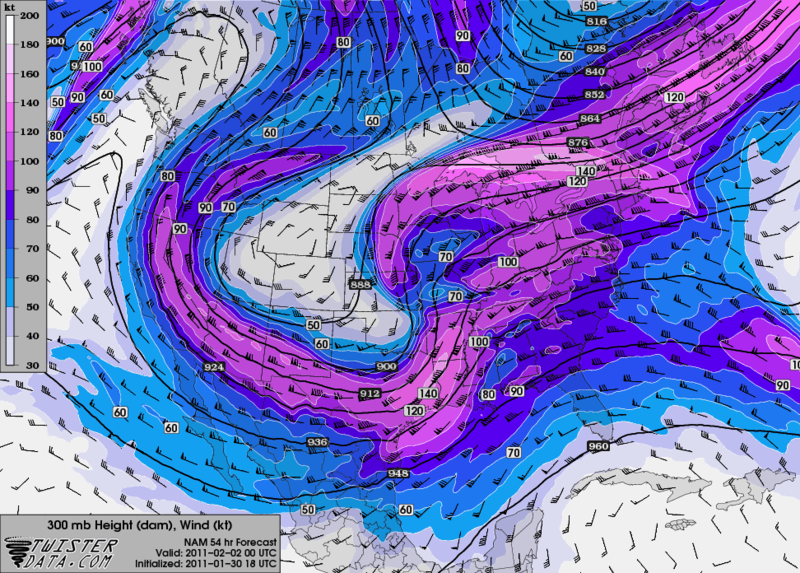 The system is expected to bring more severe weather to the eastern part of the U.S. through Tuesday and Wednesday. At the time of this writing, a squall line has developed in the Mississippi River Delta that is expected to push east overnight, bringing strong winds, rain, lightning, and the risk of embedded tornadoes. This scenario is more complicated than the setup for the last big outbreak, which had a single powerful system to generate the intense weather. 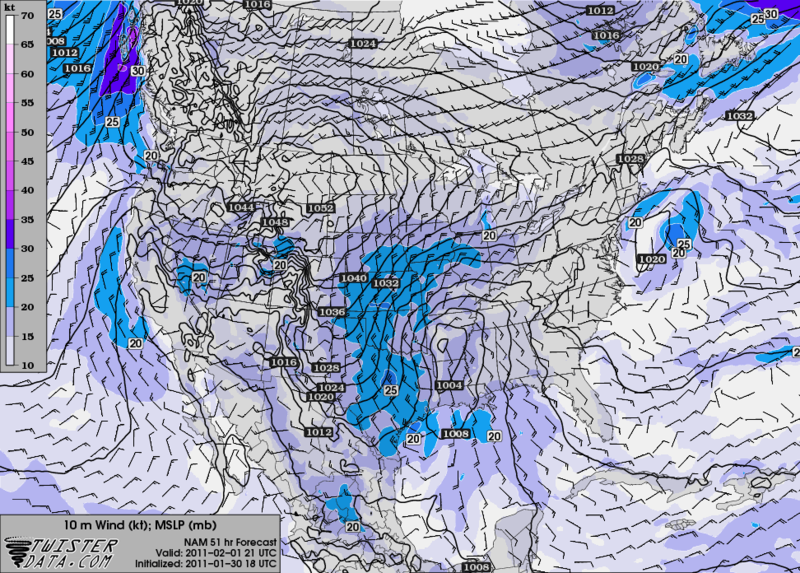 A closed low located over Arkansas is responsible for the day 1 activity. 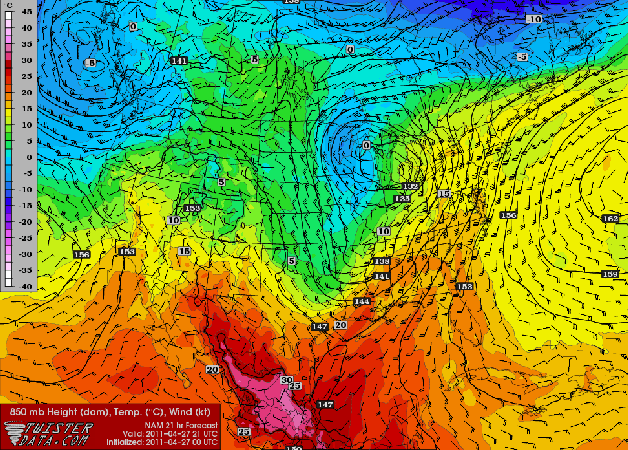 This low formed today from a shortwave kink in an upper trough. This low is expected to be blocked by a strong high pressure system off the Atlantic coast, causing it to move north and eventually northeast to die out over the Great Lakes area. 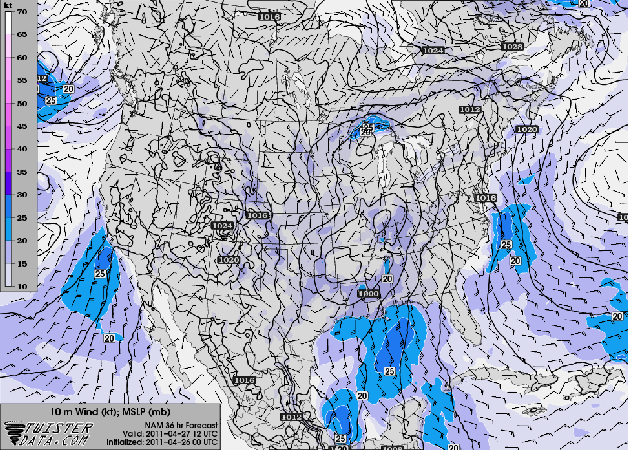 However, a second shortwave kink is expected to enter the mid-South and undergo cyclogenesis on Tuesday afternoon or evening. 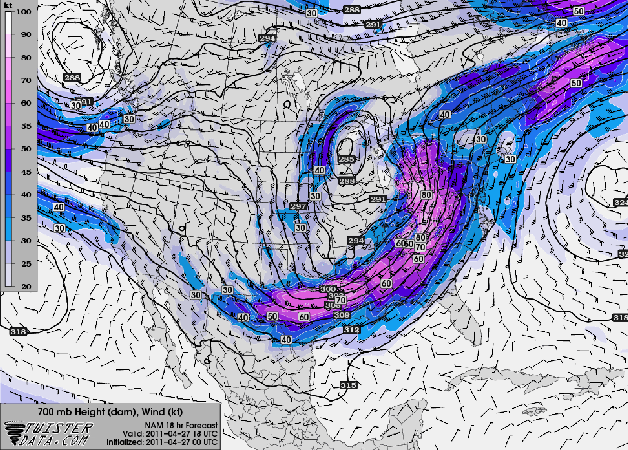 The combination of the current cyclone’s development, the upper-atmospheric jet that is causing all this shortwave activity (see below), and the next cyclone’s appearance on the scene will result in there being significant sources of uplift. The highest values of instability in the event are currently prognosticated by the models to occur around midday tomorrow. 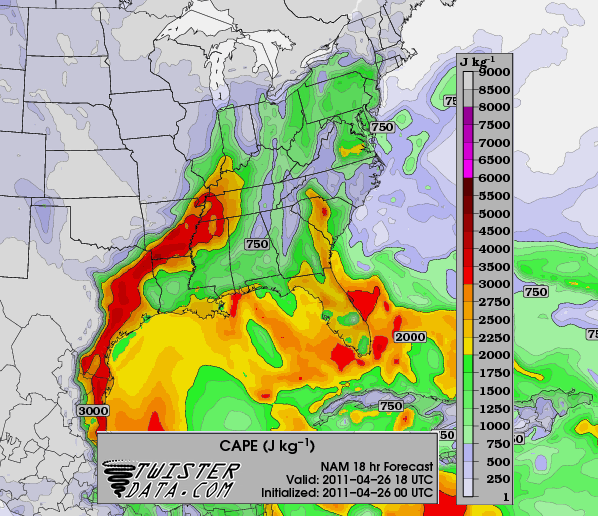 The NAM and GFS generally agree on the areas of high CAPE, with each model forecasting at least 3000 J/kg (and it should be noted that models do not do well with CAPE and have a tendency to underforecast. Keep an eye on observations such as soundings). 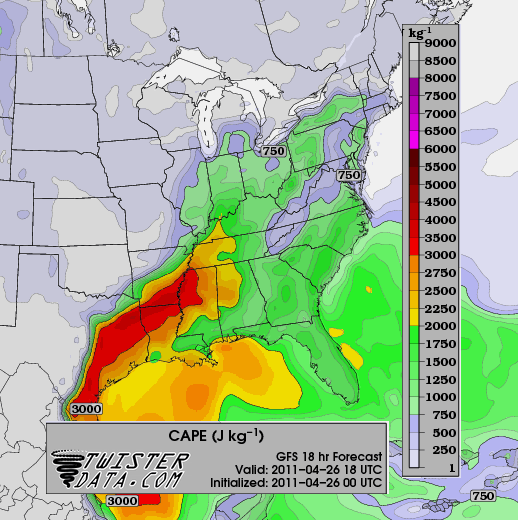 For Wednesday’s event, the highest CAPE values are expected to be over Mississippi. 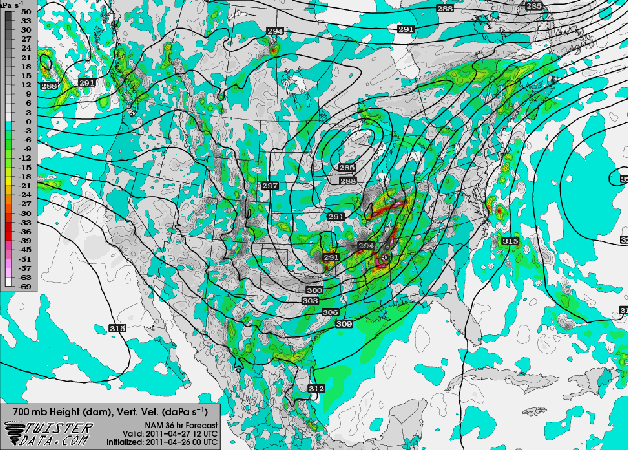 The NAM and GFS agree on the maximum values but have the location and orientation of the high CAPE axis different. 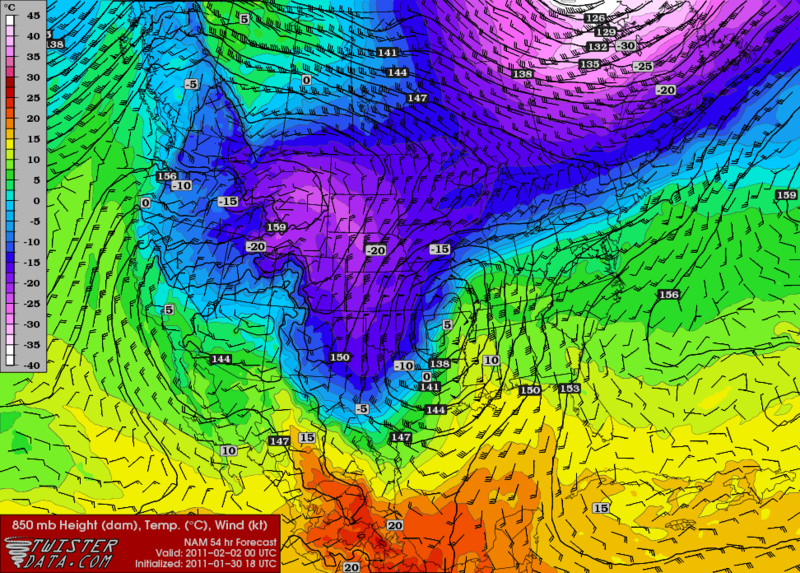 I am especially concerned about the middle part of Tennessee on Wednesday if that is accurate. 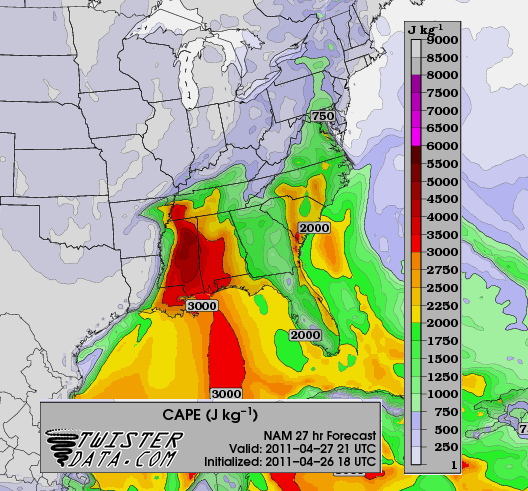 Those EHI values are almost off the scale, and they coincide with an area of at least 3000 J/kg CAPE. 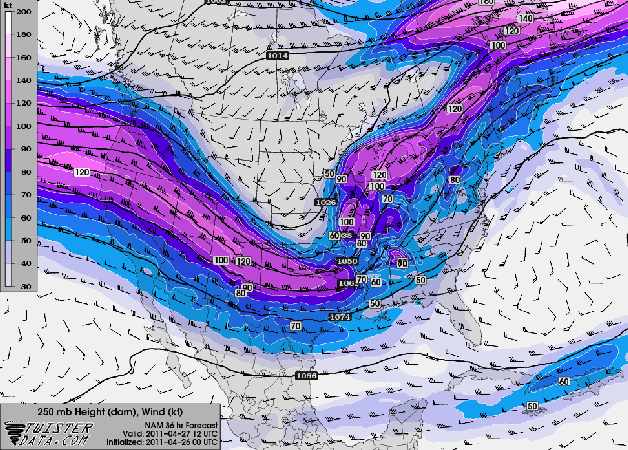 That area has a history of tornadoes, and between the strong instability, powerful uplift, and helical pattern to the winds, I think it is quite likely that the Tennessee valley may be in the worst part of this outbreak. The Storm Prediction Center has already put up a Moderate risk for Tuesday and Wednesday. It is thought highly likely that at least one, if not both, of these days will see that risk upgraded to High.